A message about the X of Indian Vegetables: Three weeks from now will be the turn of the letter X. This represents a challenge for this series, and calls for another loophole, I think! In mathematics, the letter X represents an unknown value. X is the letter of mystery, so here is the challenge for X: Choose any fruit or vegetable that is unknown to you...either you have never tasted it, or never cooked with it. Then, use it in any dish of your choice that uses Indian flavors. Here is your chance to scour your grocery store or farmer's market, or go find some exotic ethnic store in your town, and try something fresh and new, do some Xploration! It should be Xciting :) Do you have to take up this challenge for this letter? No, if you come up with something else that fits the X theme, that would be welcome too! The letter U inspired nineteen unique Indian flavors! First, the U vegetables. Several of them happen to be root vegetables that are utterly useful in the Indian kitchen, with names representing different languages from Southern India. Ulli is shallot in Malayalam, the language of the Indian state of Kerala. This tiny root vegetable is said to have a flavor in between onion and garlic. Bee of Jugalbandi overcomes her aversion to shallots and cooks up a pot of tempting Ulli Sambar...lucky Jai gets to eat the whole thing! Ullipai is onion in Telugu, the language of Andhra Pradesh. Hima of SnackORama combines onion with another delicious U food, urad dal, to fry up some golden and crispy Ullipai Urad Masala Vada that are the perfect accompaniment to a good basketball game. Suma of Veggie Platter pairs the bland and creamy potato with some lush green pleasantly bitter fenugreek leaves to make this delicious platter of Urlagadda Menthaku Koora. 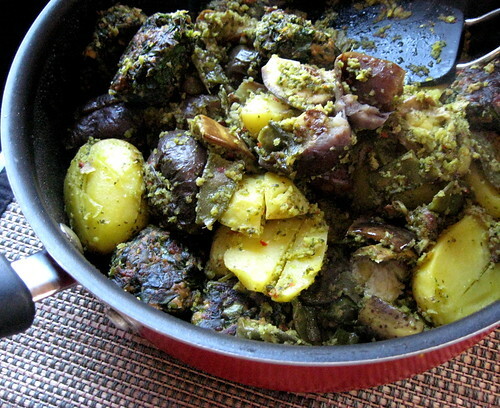 G V Barve of Add Flavor makes a traditional potato curry, a spicy savory treat called Urulaikilangu Masal. Linda of Out Of The Garden makes the perfect tea-time snack- she dips spicy mashed potato into batter and fries it to perfection to make these delicious Potato Bondas. Next comes an U fruit: Uvas are grapes in Brazilian, Portuguese and Spanish...I learned something new today! A Cook of Live To Cook does something daring...she stuff grapes and turns them into a tempting curry called Uvas Bhagara. The next U food is a lentil that is a staple in Indian kitchens: Ulundhu is Urad dal or split black lentils in Tamil. Laavanya of Nuggets of our Life grinds some soaked urad dal and adds a selection of spices to make a batch of mouth-watering Ulundhu Vadai. We now come to four U dishes that are very special: each of them is more than a recipe. It is a method of cooking, a concept for making a nutritious meal. Once you have learned the method, it can be changed around creatively to make endless variations. The first such dish is Usili. The idea of this dish is: Protein-rich lentils are soaked to soften them, then crushed to a coarse paste and steam-cooked. Then, when making any simple vegetable stir-fry, these lentil crumbles can be added to the dish to provide a quick boost of protein, texture and color. Nandita of Saffron Trail illustrates the method of making usili with her detailed recipe, complete with helpful hints and tips, for Usilu with Ivy Gourd. Aarti of Aarti's Corner makes another type of traditional upma- this version is made with coarsely ground wheat grains, known as rava or sooji or semolina or cream or wheat. This dish of Upma is a truly traditional recipe. Swapna of Swad illustrates how vegetables can be added to upma to make it even more nourishing and colorful- here, she uses peas to make Matar Upma. Saju of Chachi's Kitchen makes an interesting variation using bulgur, a form of wheat that has been pre-cooked and then ground, making it a quick-cooking food. Her recipe gives an informative step-by-step look at the making of a delicious and colorful bowl of Upma with Bulgur. Asha of Aroma/ Foodie's Hope gets inspiration from Mexican cuisine and makes a unique version: she combines rava with cornmeal, with a dash of salsa for added flavor, to make a gorgeous dish of Uppitu with Salsa. The third dish is called Usal in Maharashtra. It is a quick and everyday way to make a semi-dry preparation of legumes and beans and is an integral part of the Marathi meal. Once you know how to make usal, you can incorporate beans and peas in your diet and keep things interesting! Aarti of Aarti's Corner makes the most traditional type of usal that there is: using sprouted matki or moth beans to make Matkichi Usal. Richa of As Dear As Salt uses a different bean that is an Indian staple- she cooks whole moong beans into a delicious Moogachi Usal. TC of The Cooker illustrates how one can take this traditional method of making usal and adapting it to new ingredients. She uses soy beans in her creative dish of Usal with Endamame. The fourth dish is the Uttapam. A fermented batter of Urad dal and rice is cooked pancake-style, and can be adorned with herbs and veggies galore to turn out colorful and tasty brunches. G V Barve of Add Flavor uses a rainbow of veggies (quite literally!) to make some pretty and festive Urulaikilangu Uttapams. The next entry is a very unusual one. Suganya of Tasty Palettes scours her cookbooks to come up with an old recipe for a tangy preparation called Uppadam, something she remembers her grandmom making. She uses okra and a bunch of unusual dried berries to make her very own version of Uppadam. Let's end with another unexpected entry: Upvas is the Marathi term for "fasting", days when restricted foods are eaten for religious observance. The tradition of fasting has given birth to many special (and very delicious) foods. Manasi of A Cook At Heart makes a favorite from her childhood- a scrumptious pancake called Upvasache Sabudana Thalipeeth. Just as places are represented by their monuments, the historic events that took place there, and by the celebrities that they birthed, places are represented even more by food. The mere mention of thin crust pizza brings with it visions of a New York City neighborhood pizzeria, with the brick oven and red-white checked tablecloths and the plastic shaker filled with red pepper flakes. Every place on this planet- whether it is as large as a country or as small as a sleepy little town- seems to have its iconic food that makes locals proud and bring visitors flocking by. My home-town of Kolhapur has several foods that it is known for: there is the Kolhapuri pedha (a milky sweet) and the spicy meat dishes, and the Kolhapuri misal. The place I currently live in- St. Louis is famous for its frozen custard. What is the food specialty of your town? Please share it in the comments, I would love to know! The regional dish that I wanted to show-case in this series was a no-brainer. 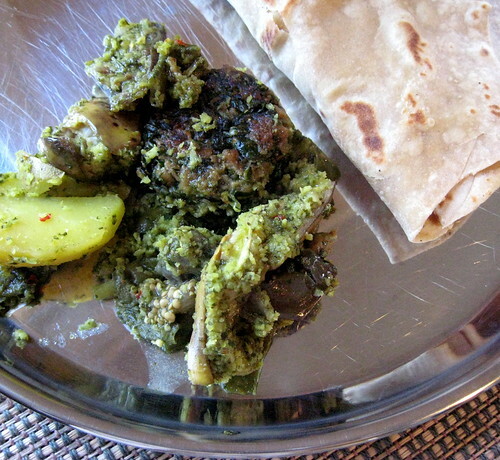 Undhiyu is one of those dishes that one does not just throw together at the last minute. It is a labor of love, requiring care in preparation and a number of ingredients that need to be procured and prepared carefully. 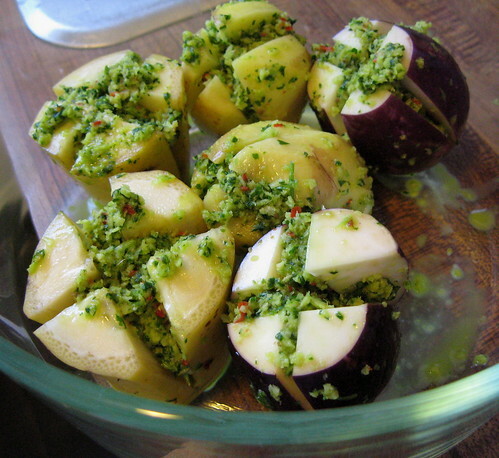 Undhiyu is a wonderful dish of mixed stuffed vegetables that comes from the Western Indian state of Gujarat. The city of Bombay is home to a vast and vibrant community of Gujaratis and my grandmom (aji) in Bombay has a host of Gujarati neighbors and friends. It is but natural that Gujarati cooking has influenced our palate. Aji would often make a delicious undhiyu as a special lunch for us, and there are small family-owned restaurants in Bombay where you can buy the most exquisite undhiyu by the kilo. It is traditionally a winter dish, and is traditionally baked in a clay pot. Well, since the U of Indian vegetables happened to come around in the middle of June, and since I will cook in a clay pot only in my dreams, here it is: my version of undhiyu, made on the stove-top, and delicious enough for any old season. This is a recipe that I pieced together from various recipes found all over the internet. To me- there are three key things that "make" the undhiyu: the flavor of ajwain or carom seed, the fenugreek balls (muthiya) and the banana chunks. The ripe banana chunks that you peel as you eat are especially delicious, giving the dish a sweet-savoury flavor. Traditionally, undhiyu calls for a few vegetables that can be hard to find outside of Indian stores: yam, baby eggplants and a type of bean called Surti papdi. I skipped the yams and managed to find the other two in our international market. Normally, one would deep-fry the muthiya, but here, I just made little patties instead of balls and shallow-fried them. I think this variation worked just fine and was a lot less messy than deep-frying. I could not manage to get very pretty photographs of this dish, but believe me when I say, it tastes heavenly and is well worth the effort! I am making no claims as to its authenticity- but it tasted wonderful to me! 1. Mix all the ingredients for the "masala paste" together and grind to a thick paste adding a little water if required. Set aside. 2. Prepare the vegetables: Peel the baby potatoes (can leave skins off if desired) and make a deep X-shaped cut without cutting all the way. Remove stem from baby eggplants and score them with an X-cut too. Wash the banana (do not remove the skin!) and cut into 5 pieces. Score each piece with an X-cut too. 3. Stuff the masala paste into the cuts made in the vegetables and set them aside for 15-20 minutes. 4. Meanwhile, make the methi muthiya. Combine all ingredients except the oil. Mix well and make into a stiff dough adding a little water as required. Pinch off bits of the dough and make little patties (about 10-12 patties). Heat the oil in a skillet and shallow-fry the patties in batches. Drain on paper towels and set aside. 5. To assemble the undhiyu, heat the oil in a large shallow pan. Add the Surti papdi beans and ajwain and stir-fry for a couple of minutes. Add the salt, then arrange the stuffed veggies in the pan. Cover and cook for 15-20 minutes or until the vegetables are tender (add 1/4 cup or so if needed while cooking, just so there is enough steam for cooking). Stir carefully in between, making sure that the vegetables do not fall apart. 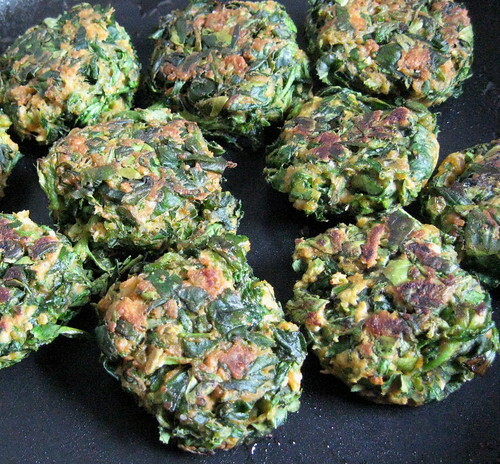 During the last five minutes of cooking, add the methi muthiya and stir gently to combine. Serve hot with rotis. Undhiyu does not go well with rice, in my opinion. It should be served with flatbreads such as rotis or phulkas or parathas. Discard the banana peels as you eat. Kashmir: Dum Aloo from Food For Thought. Great job on the effort that you have put for this. Your parents and hubby must be a happy bunch with this on their plates! your undhiyu looks great. I also like the taste of saunf and sesame seeds added to masala paste. but well, I think they vary by who you get the recipe for. Also, regarding the vegetables for undhiyu - we get packets of mixed frozen veggies specifically for undhiyu in our indian store. and, believe it or not, the pack also contains the methi muthiyas!! That is how I make undhiyu here, but I bet fresh tastes way better than frozen. Before I start raving about the undhiyu and the roundup....I was so relieved to read the msg about 'X'! With that out of the way....the undhiyu looks great. Never had the 'daring to make it. The roundup is fab as usual...it is amazing how you manage get things together without fail on Sundays! Lovely, lovely, lovely, as always! I've been away for a bit, and came back to this wonderfully delightful dish, which I tasted just once many years ago and have never forgotten since. And now at last, a chance to try it out from a source I trust completely - you!! Just one quick question - do the stuffed veggies need any additional water to cook in, or do they cook in their own steam? Thanks. And thanks also for the absolutely charming pictures and writeup of Dale's dog run activities. Lovely and a recipe that does not calls for loads of oil!! I love Undhiyo, we used to get it from saurashtra sores in Dadar, AWESOME taste, but a layer of oil that had to be thrown before u could reach the veg!!! THank u for ur version!! and a great round up as usual!!! Wonderful roundup, I also made Undhiu on Friday to cater it to a Gujarati marriage. Its a wonderful dish and needs a lot of hard work and patience. Took me 8 hrs from start to finish.Thanks for sharing the recipe. Undhiyu looks great. I've only tasted the frozen one and if that itself tasted good for me - this homemade version must be divine. Richa, ooh, must keep an eye out for green garlic! That would be so tasty! Linda, I've heard of baked beans as a New England specialty (and quite enjoy eating them on toast) but the other foods sounds positively yummy too! Asha, your uppitu was so creative! Mika, actually, I was also very hesitant about making this, but in the end, it is not much more time-consuming than many other dishes we routinely make! Sana, love the idea of adding saunf and sesame...will try that next time. I have used the packets of undhiya veggies a few times in NYC, but would always be disappointed at the same small quantity :) This made a big pot :) I think I will stick to the fresh, but when we have guests etc. so that I can make a big batch and get a lot of it. 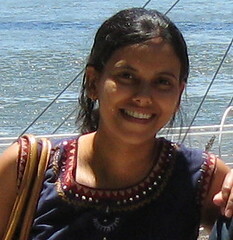 Kamini, I do hope you get a chance to try it! I was pleased at the taste :) Thanks *so* much for reminding me about that step: I omitted to add that: yes, you do need a little water to generate enough steam to cook the veggies. I have corrected it in the recipe. Shreshtha, you catered a wedding?? Wow, that must have required a hundred times more undhiya than I made! Hats off to you! Would love to see your recipe sometime, bet it is professional and the "real thing". Laavanya, hope you get a chance to try the fresh version...it is not that much more difficult than the frozen kind! It's so true that undhiyo needs to be prepared with care and effort. I love this dish. My masee staying in Surat makes this every time we visit her. I love the muthiyas and the oil layer:). As Mansi said, we used to get undhiyo on Sundays from Saurashtra. However, I have been lazy to cook it from scratch. Do u know tht in Indian stores we get packed undhiyo veggies where we just need to add some masala? I often get it. I love ur recipe and pics. Good job! And yes, I was relieved to read the message abt X.
Hi Nupur ! Truly amazing! Thanx so much for my favorite gujarati recipe 'undhiu' - i have only tasted the 'deep' foods version which is very oily ! now , you have taught me how to make bthis delicious dish from scratch . Nupur , what about theTamilian all time breakfast dish 'uppuma ' made out of Rava , Semolina and poha ! easy to make and also pretty nutritious served with so many different chutneys! also , uppu , the tamizh name for 'salt' is an important ingredient of any cooking ! A tAMIZH SAYING GOES 'UPPU ELLATHA PANDAM KUPPAIYILE ' - dishes made without salt should be thrashed meaning it is salt that adds taste to dishes! Thank You for an awesome round up on U.Undhiyu looks great.will try them soon.Tried Aloo gobi and Bharli Mirch.came out so good!Thanks.Durga. Swapna, yes, I have tried the packed undhiya veggies several times but am not such a big fan! Cynthia, :) yes, this is no light meal! Sana, much easier to just buy the veggies separately, right? Anon, uppma is covered in the round-up as you can see. Sheela, it is labor intensive but not as bad as we imagine :) Can't wait to see your V entry!